Panamera and Cayenne to offer the next-gen system. A few years ago, I tried adaptive cruise control for the first time — a week in Boston's horrific commuting traffic, in a Volvo XC60. It was a revelation. Without the need to constantly brake and accelerate, stop-and-go traffic on the highway was significantly less stressful. A number of Porsche vehicles have a similar adaptive cruise system, meant to alleviate frustration in stop-and-go traffic. But the company's engineers have developed a new system that puts a Porsche-esque twist on the whole thing. It's called InnoDrive, and it's very clever. Originally developed as a way to improve fuel efficiency, InnoDrive is kind of a sport-focused cruise control designed for twisty B-roads rather than highway backups. In the same way that Volvo's system relieved me of the need to operate the pedals, Porsche's InnoDrive frees me from the same thing when driving spiritedly on backroads. It uses sensor data from the car to "determine the perfect, efficient longitudinal drive strategy," Dr. Gernot Döllner, vice president in charge of Porsche's Panamera product line, said in a press briefing. That's a fancy way of saying that InnoDrive lets you focus on steering while the car optimizes your speed, taking into account speed limits and corners. The Panamera is the first Porsche to offer InnoDrive, though it will also be available on the new 2019 Cayenne. The test drive was on the same lovely roads around Porsche's Stuttgart headquarters that the InnoDrive team used to develop the system. 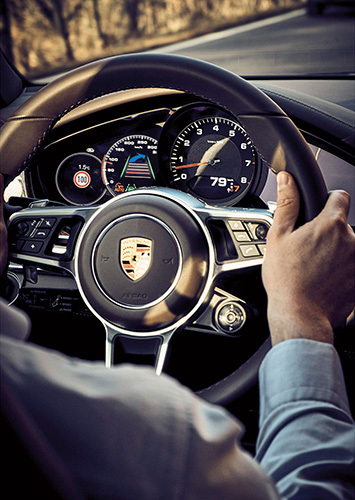 In a sense, InnoDrive is an innovation (hence the name) of the existing adaptive cruise control system that Porsche has offered for several years — only it uses curve angles and topographical information to determine the optimal speed for hustling through corners. "It uses that information to adjust the vehicle to the perfect speed for the road," Döllner said. It's not a system for driving through the city. Instead, it's "for country roads and relaxed traveling." Activate the system (and have a GPS destination set), and the car analyzes the onboard mapping data to determine the radius and topography of upcoming turns. 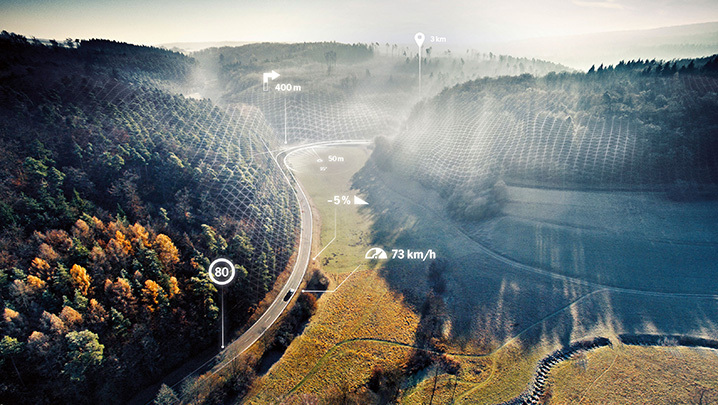 Combine that with speed-limit info from the mapping data and the onboard camera (the camera gets priority, as the mapping data provided by HERE — a mapping company jointly owned by Volkswagen AG, BMW, Daimler and others — isn't always accurate) and the car can determine how fast to take upcoming corners. A status screen to the left of the giant tachometer on the dash shows the current speed limit and what InnoDrive is up to. The speed limit (or a manually adjustable offset) is the max that the car will go. But when the system decides a corner will be too sharp, it slows down to a dynamically determined speed (all illustrated in blue, to keep the driver appraised of what's going on and why) and then speeds up again as it exits the corner. Standard adaptive cruise control rules apply as well, with the car slowing when it comes upon another vehicle. Lateral acceleration is the name of the game here, and the car adjusts speed to keep things sporty but under control. Activate the Sport or Sport+ drive modes and the car allows for 20 percent more lateral acceleration than in the standard drive modes. It's a noticable difference, but it still keeps the car far from its limits. "We had a Sport+ version, and the system is able to do much more than we realized," said Döllner. "Even experienced drivers could be scared of what the vehicle would allow so we had to take that off." It's not meant to be faster than an racing driver, but instead to allow Porsche's more suburban buyers to feel like a racer. "It could be as fast as a human driver, but it's not designed that way," Döllner said. "It's next-generation cruise control, but 10 percent more efficient, too." The sports-car purists are surely heading to the comment section now, ready to deliver a healthy dose of Sturm und Drang in Porsche's direction. But that's the same sort of thinking that says Ferrari should still offer manual transmissions, even though every technical and performance spec says automatics outperform them. Though Porsche buyers surely consider themselves the next André Lotterer, the truth is that, for most, their car is considerably more capable than they are. InnoDrive, like anti-lock brakes and traction and stability control, increases enjoyment and safety. By freeing up the driver to focus on steering, it's possible that driving enjoyment, safety and efficiency (the original intent of the system) are increased. Sure, InnoDrive is perhaps a niche technology, but no one is forcing Panamera and Cayenne buyers to check the $4,000 option box to get it. It is, though, a clever repurposing of technology already installed on the car — InnoDrive adds an extra ECU on top of the adaptive cruise to manage things, but it uses the same sensors — to add new and useful functionality. The team said that the greatest obstacle to further improvements and new features was the reliability and precision of the mapping data. The curve data Porsche receives from HERE is limited in detail, and the InnoDrive system uses a complicated algorithm to determine the correct speed — and it's not always exactly correct. If the driver inputs more steering than is expected, InnoDrive realizes it's going too fast and slows down. But it happens in real time, and the system isn't able to remember what happened on that corner for the next pass. Naturally Porsche's engineers wouldn't give any hints as to what the next iteration of InnoDrive will include, but they were clear that this is just version ein.